Dinosaur Thunder continues James F. David's adventured-filled series that links the past and the present, bringing Cretaceous-era dinosaurs into the modern age. Eighteen years ago (in one of the earlier volumes), the planet was swept by time waves that intermixed the Cretaceous period with the modern era. Whole cities disappeared, people were lost, and large swaths of globe became replaced by dinosaur-infested forests. In the end, humanity survived, and learned to live with the dinosaurs. However, a new crisis looms on the horizon. New dinosaurs have inexplicably appeared. And new time passages appear linking the modern era to the Cretaceous, where humans still fight to survive. Making things even stranger, a Tyrannosaurus Rex has been spotted on the moon, trapped within a block of orgonic matter (as opposed to "organic" matter?). It is up to our old friend, Nick Paulson, the director of the Office of Security Science, and his motley group fellow time travelers, to figure out what is going on. Making matters worse, Nick Paulson finds himself and a number of his motley crew transported back to the Cretaceous Period, 65 million years ago, as the comet that wiped out the dinosaurs speeds toward Earth. And he is astonished to discover humans struggling to survive against another sentient species (called the Inhumans by the locals), a species that nobody knew existed. As Nick and crew struggle to get back home, other members of the Office of Security Science find themselves in a race to make sure that the impending comet crash does not affect the present. Despite the fact that this book is a continuation of David's broader series, it is not necessary to have read his earlier books. David provides a neat, easy summary in the beginning, and sprinkles reminders of what happened in earlier books throughout the course of the story. So I never felt lost as I read the book. Overall, Dinosaur Thunder never lacks for interesting twists, and David's strength as a writer lies in his ability to conjure up interesting plot lines. Those who like dinosaurs, conspiracies surrounding the dinosauroids, time-travel, and those who are unfazed by unlikely pseudo-science will find much to enjoy in this book. Objectively speaking, however, this book is not very good. 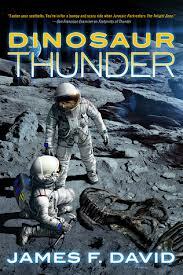 Readers who enjoy character-driven stories will be sorely disappointed with Dinosaur Thunder. The good characters are good; the bad characters are bad. There is little in-between. Some characters, notably Wynooski, are so patently annoying that you can't wait for them to be killed off or written off the page. Only one character, the Reverend, goes through any character development during the course of the novel. Furthermore, women are at times characterized rather poorly. Granted, the book features intelligent and strong women, women who are able to get the job done just as well as their male counterparts. But at multiple points they appear more interested in how perky their breasts are than in their overall predicament of being sent to the Cretaceous Era (or, at one point, Mars). More importantly, Dinosaur Thunder also lacks any sense of tension. Only at one point in the book did I feel a sense of tension. Otherwise, I never worried about what was going to happen to the main characters. Nor did I care much. This, no doubt, stems from the lack of attention to overall character building throughout the book. Dinosaur Thunder also is in dire need of another round of editing. To give but one example, at one point a velociraptor bites down on a main character's leg. Then, in the middle of the same paragraph, the reader finds that very same velociraptor biting on a different person's leg... <sigh>. Mistakes like this should have been caught by proofreaders or the editorial staff. Despite all these problems, and despite the fact that it is not an objectively good book, we still give Dinosaur Thunder two thumbs up. It is nerd-tastic. Nerd-gasmic. David does so much right that we not only forgive the fact that this is not a very good book, we embrace it. First, he sends Portland, OR, into the Cretaceous Era. What type of genius is that! Portland! Just as the city thought it couldn't get any more eco-friendly, it gets sent back to the Cretaceous Era. Second, he has an awesome opening scene, where men in spacesuits witness a live Tyrannosaurus Rex struggling to break free of its rocky prison on the moon. Dinosaurs in space -- what could be more nerdy than that? Third, David actually has an ingenious take on the conspiracy theories surrounding the dinosauroids, a take that he fleshes out in this book in broader detail. These very points, added to the fact that this book is really about time-traveling and space-traveling dinosaurs, make Dinosaur Thunder pure genius, a must read for nerds of all shapes and sizes. Penalties: -1 for annoying characters; -1 for bad editing; -1 for a lack of tension throughout the book. Bonuses: +3 for dinosaurs on the moon and time-traveling dinosaurs; +2 for sending Portland into the Cretaceous Era; and +2 for an interesting take on the sentient dinosauroids. Nerd Coefficient: 8/10. "Well worth your time and attention"
Read about our scoring system, in which average is a 5/10, here.